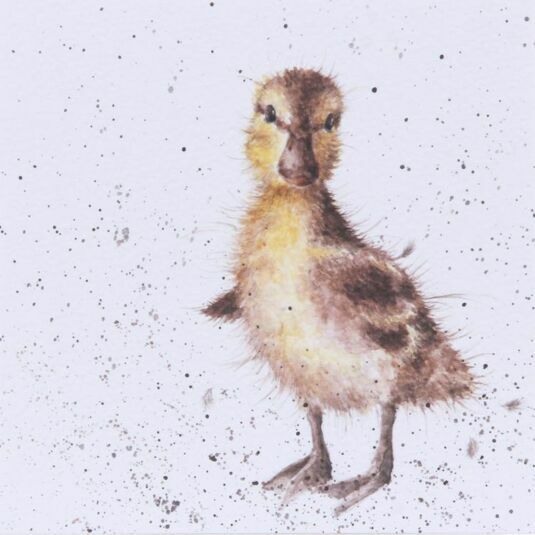 An adorable duckling, only recently waddled into the world, looks quizzically out from this card. His tiny wings are spread to help him balance, and his webbed feet are slightly turned in. He is painted in a soft water colour style, with yellow chest, tummy and face, with soft brown wings, beak and body. The card is supplied with an envelope in a subtle shade of brown, to match the earthy tones of the illustration. Blank inside for your own message. This delightful set of cards is inspired by the unique animal characters seen in the British countryside, farmyard and home. They are designed and printed in England using low environmental impact materials. The design is taken from an original artwork by Hannah Dale of Wrendale Designs. Each image is delicately painted with soft brushwork, subtle colours and paint spatters which are the trademarks of her style. Hannah is an ex-stockbroker turned farmer’s wife who, inspired by her rural married life, embraced her artistic roots and began painting the animals in the landscape around her.